The REAL true story of Eleanor Rigby! Chapter 1: Life before Chalk Boy! Well they do often say that truth is stranger than fiction so I’m about to tell you about the true ‘untold’ story of Eleanor Rigby. Others believe that Father McKenzie refers to ‘Father’ Tommy McKenzie, who was the compare at Northwich Memorial Hall. The Beatles finished the song in the music room of John Lennon’s home at Kenwood. John Lennon, George Harrison, Ringo Starr, and their friend Pete Shotton all listened to McCartney play his song through and contributed ideas. Starr contributed the line “writing the words of a sermon that no one will hear ” and suggested making “Father McCartney” darn his socks, which McCartney liked. Shotton then suggested that McCartney change the name of the priest, in case listeners mistook the fictional character in the song for McCartney’s own father. The song is often described as a lament for lonely people or a commentary on post-war life in Britain. McCartney couldn’t decide how to end the song, and Shotton finally suggested that the two lonely people come together too late as Father McKenzie conducts Eleanor Rigby’s funeral. At the time, Lennon rejected the idea out of hand, but McCartney said nothing and used the idea to finish off the song, later acknowledging Shotton’s help. Lennon was quoted in 1972 as having said that he wrote 70% of the lyrics, and in 1980 claimed that he wrote all but the first verse, but Pete Shotton, Lennon’s childhood friend, remembered Lennon’s contribution as being “absolutely nil”. Donovan also reported that he heard McCartney play it to him before it was finished. In the 1980s, a grave of an Eleanor Rigby was “discovered” in the graveyard of St. Peter’s Parish Church in Woolton, Liverpool, and a few yards away from that, another tombstone with the last name McKenzie scrawled across it. During their teenage years, McCartney and Lennon spent time “sunbathing” there, within earshot of where the two had met for the first time during a fete in 1957. Many years later McCartney stated that the strange coincidence between reality and lyric could be a product of his subconscious, rather than being a meaningless fluke. 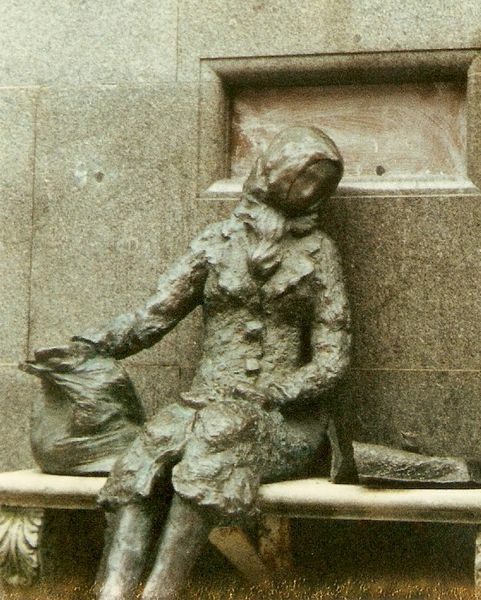 The actual Eleanor Rigby was born in 1895 and lived in Liverpool, possibly in the suburb of Woolton, where she married a man named Thomas Woods. She died on 10 October 1939 at age 44. Whether this Eleanor was the inspiration for the song or not, her tombstone has become a landmark to Beatles’ fans visiting Liverpool. A digitised version was added to the 1995 music video for The Beatles’ reunion song “Free as a Bird”. In June 1990, McCartney donated a document dating from 1911 which had been signed by the 16-year-old Eleanor Rigby to Sunbeams Music Trust, instantly attracting significant international interest from collectors because of the significance and provenance of the document. The nearly 100-year-old document was sold at auction in November 2008 for £115,000 ($250,000). The Daily Telegraph reported that the uncovered document is a 97-year-old salary register from Liverpool City Hospital. The name E. Rigby is printed on the register, and she is identified as a scullery maid. Now that’s all very fine and dandy and perfectly correct if you believe that THIS Eleanor Rigby is the ONE & ONLY E. Rigby. It’s well-known that in 1946 the McCartney’s moved to 72 Western Avenue in Speke. In 1948, the family moved again to 12 Ardwick Road (also in Speke) which was part of a new estate in the suburbs of Liverpool where they stayed until they moved to Forthlin Road in 1955. It is reasonable to assume that Eleanor was the daughter of William J Rigby who by 1900 was 33 years of age. Eleanor was actually christened “Eleanor Maud Rigby” and had at least two brothers: Reginald and Jim Rigby and one sister Dolly Rigby. Not much is known about Eleanor’s early life except that she worked as a domestic servant from the age of 11 and by the age of 16 had spent some time working at the Adelphi Hotel in central Liverpool. It was a lowly paid existence with very long hours of work. Young girls where often expected to go ‘into service’ at a very young age, often as young as 8….either that or go to the workhouse! In her mid-twenties, Eleanor went on a bicycle ride with some friends to the nearby village of Hale; here she met a young ‘journeyman’ Thomas Battle……a travelling joiner and wheelwright from Kilkenny in Ireland. Thomas was to become Eleanor’s husband and with little or no money the couple moved to a caravan in Dragon Lane, Whiston. At the age of 29 Eleanor Rigby (now Eleanor Maud Battle) had her first son…..a little baby boy named Peter James, born on the 21st March 1929 in a ‘the brown caravan’ in Dragon Lane, Whiston. Peter was the first of six sons closely followed by Thomas, also born in the caravan!- 20th April 1930. The brown caravan was now becoming rather small for a growing, young family and shortly after the birth of young Tommy they moved to their new home in Warrington Road, Rainhill, it was here that Peter and Tommy spent their formative years and the place where Eleanor had four more sons…..William, Jack, Norman and Charles Reginald. They now lived in a big house close to the corner of Rainhill Road, little Peter would often be found looking out of his bedroom window, watching the ‘trolley buses’ (a cross between a bus and a tram) travelling back and forth between Prescot and St Helens. 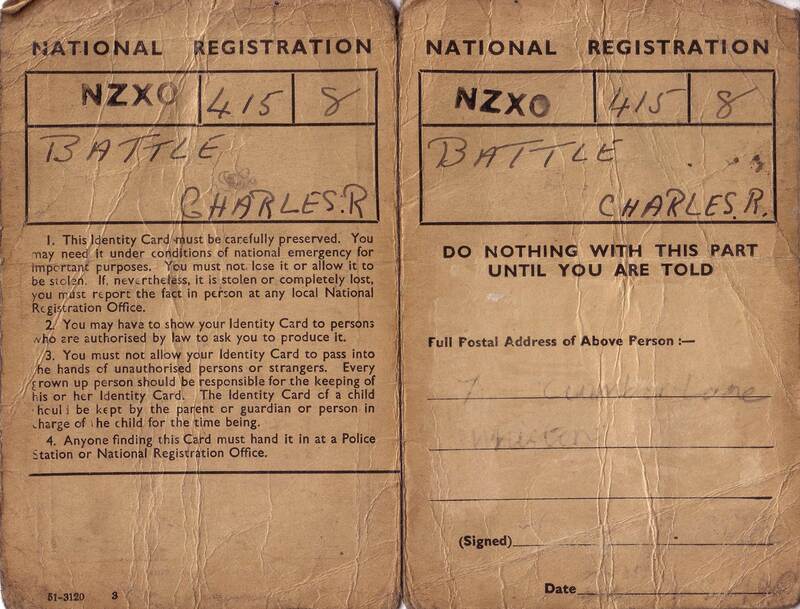 National War-time Indentity card for Eleanors youngest child Charles (age 5) while living at Cumber Lane, Whiston. The year was 1939 and Britain had declared war on Nazi Germany and the aptly named Battle family moved to their new home only a stone’s throw away from their old caravan on Dragon’s Lane. At 7 Cumber Lane, Whiston; little Peter now aged 10, Young Tommy, aged 9 and the rest of Eleanor’s children witnessed the start of World War 2. In later life they would recall the watching of ‘dogfight’s’ and German bombers travelling over Whiston on bombing raids to Liverpool docks and beyond…it was an exciting time for the young boys. 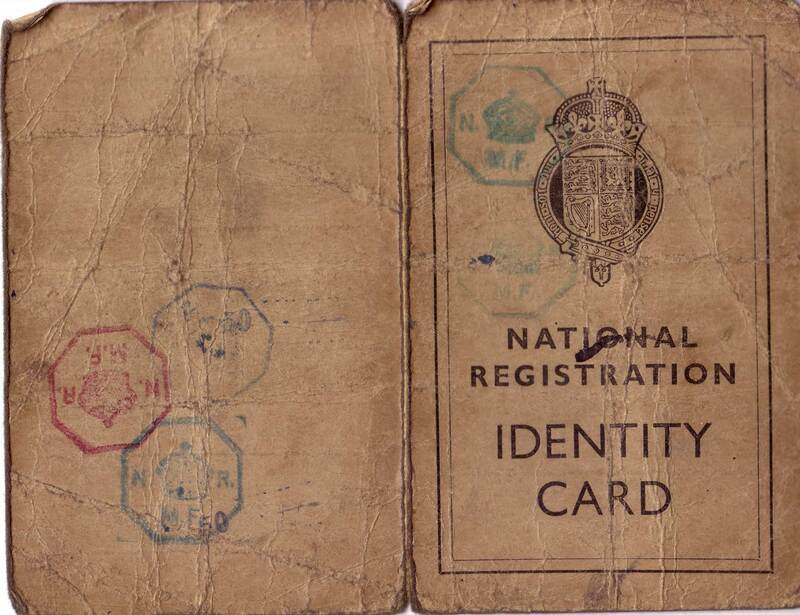 National War-time Indentity card for Eleanors youngest child Charles while living at Cumber Lane, Whiston. They would collect shrapnel, swapping it with school chums and talk of the time that a German Henkel bomber was shot down in flames and crashed half a mile away on Browns Field, Prescot. And the boys tales of the trucks full of Black American G.I’s stopping off in the local taverns of Prescot and Whiston and the drunken brawls with their white counterparts…..before travelling on their way to fight the Nazi’s and the aerodrome at Burtonwood, Warrington for bombing raids and parachute jumps over German occupied Europe. At the end of the war the family moved just over a mile away to a larger home at 105 Kemble Street, Prescot. It’s fair to say that Eleanor Rigby left Speke long before the McCartney’s ever moved to Western Avenue in 1946. Eleanor’s brothers and sister remained in Speke until the 1950’s and it’s reasonable to assume that Eleanor returned there many times during her life……by 1949, she was after all only living 7 miles away in Prescot. Paul McCartney is a master at creating musical characters and in his song Eleanor Rigby he created a character that has entered into pop history and folklore, possibly as John Lennon said “Nothing is real and nothing to get hung up about” but the truth is often stranger than fiction. As you may have guessed by now Eleanor Rigby was my Grandmother and I grew up with her at 105 Kemble Street from 1962 onwards. She died alone in her bed in 1972 and was buried in Prescot Cemetery, Lancashire. I’ve written a more in-depth version of this story where I talk about Eleanor’s sons, husband and my story of growing up with her in Prescot……but I’m saving that for my book! 11 Dec	This entry was published on December 11, 2010 at 10:26 pm. It’s filed under arts, culture, History, liverpool, music and tagged 2010, album, autobiography, battle, beatles, book, boy, chalk, eleanor, liverpool, mccartney, paul, philip, prescot, real, revolver, rigby, single, song, speke, story, track, true. Bookmark the permalink. Follow any comments here with the RSS feed for this post. Well hello Herb n fill. Thank U very much for the story ! A most enjoyable read. Thank U Very Much for sharing that story Chalk Boy. I love the story and I love the picture of Eleanor. She must have been a great Grandmother. I love the story of your grandmother Eleanor. I tell a very similar story… but my understanding when researching Eleanor-Maud over 25yrs ago and speaking with people around Prescot (who knew of her but weren’t family) and also her sister Dolly… was that she was quite an eccentric and could quite easily be the character depicted in the song…. its where Coincidence meets facts…. ! You obviously knew her… so your perception of her will be actual fact… where as me, Paul McCartney and thousands of others didn’t know her, therefore our perception is folklore and myth…..? To me it doesn’t matter whether she was THE Eleanor Rigby.. She was around at the time… she lived in the area and she was definitely a mythical character to us all…. 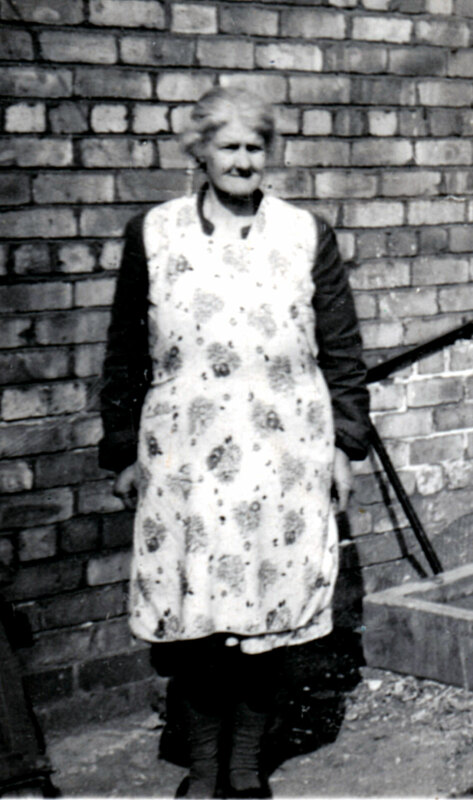 So how many people can say their grandmother was Eleanor Rigby…? I wish I’d have met her…! I can’t wait for your book…. you should call growing up with the real Eleanor Rigby….! Hi Phil, a lovely story. How is the book going by the way? Your grandmother Eleanor bore a canny resemblance to mine who lived in South Avenue! Probably the style of the time. Hi Ian….good to hear from you! How are things with you, I remember you well from school 🙂 time flys eh! I knew Maude as aunts Maude, I was born in Kemble street in 1943. Cool article! I’d like to read the book when it comes out. Did your grandmother ever tell you what she thought of the song Eleanor Rigby? Thank you for sharing.